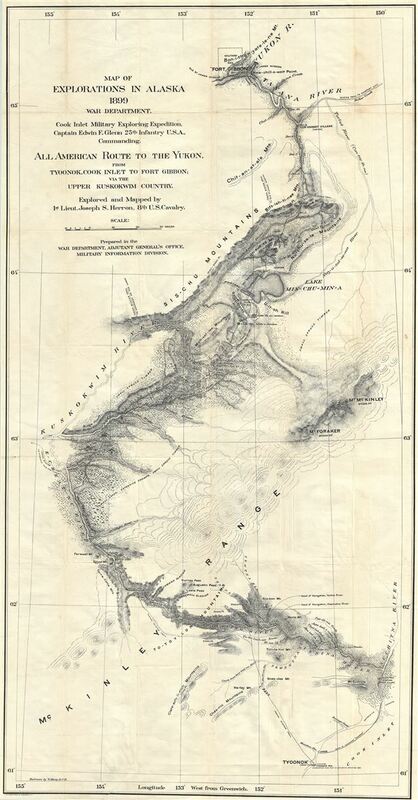 Rare map detailing 'All-American' route to the Klondike Gold Fields. Map of explorations in Alaska, 1899 : all American route to the Yukon from Tyoonok, Cook Inlet to Fort Gibbon via the Upper Kuskokwim Country. We have found this map to be extremely rare with the OCLC noting only two archived examples in Alaskan collections. Herron, J. S., Exploration in Alaska, 1899, for An All-American Overland Route from Cook Inlet, Pacific Ocean, to the Yukon (Washington: Government Printing Office) 1901. Very good. Minor wear on original fold lines. Backed on archival tissue. OCLC 309401077. University of Alaska, UAF-G4370 1899 W3.